Are you a shirt manufacturer? Or are you a Production Manager of a shirt manufacturing factory? If yes, then this is a must read article for you. You might be thinking what should be the machine productivity and what the maximum productivity level can be reached. This study results will give you a broad idea how other factories are doing. How many pieces they are making per day? Shirt Productivity per machine per day would depend on few factors such as - technology usage, availability of machine and equipment, product styling, skill level of the workers, daily working hours and on few other factors. Forget about these factors for a moment and see the real picture. How many shirts are made by factories per day per machine? From this online survey result I found that there is a big gap in between minimum and maximum machine productivity figures. 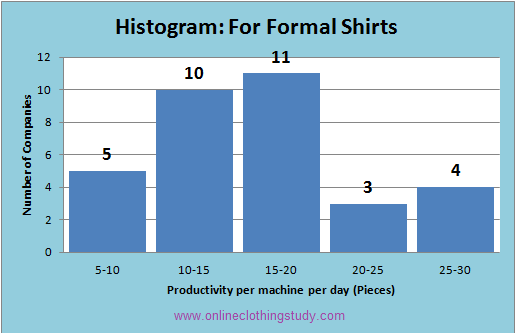 It ranges from 6.67 pieces to 28.57 pieces per day (formal shirts). So there is a big opportunity for low productivity groups. 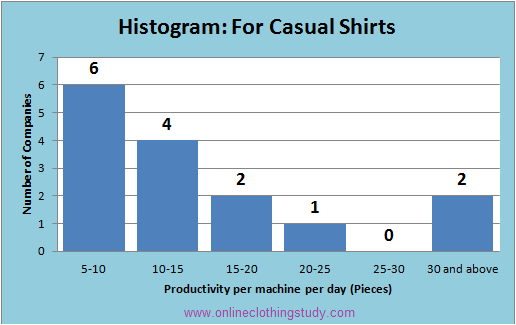 Couple of months ago (January 2014) I have conducted a survey on Shirt Productivity (Productivity Study of Shirt Manufacturing). Participants were mostly from India and Bangladesh. Data have been collected for both formal shirts and casual shirts. Factories work 8 to 10 hours per day. Few factories did not mention how many hours they work daily. Few of them may work more than 10 hours in a day. Data was received from 55 participants. All abnormal entries are discarded. After discarding abnormal entries we have following results. In the result I have not considered productivity factors such as number of working hours, technology level and operator's skill level. I have calculated productivity per machine per day irrespective of number of hours factories work daily. Read on the survey results and comment on these. You have seen that shirt manufacturing units work at difference performance level. You have to decide where you like reach. When some factories are making 20 pieces of shirts per machine per day, you can also make that much quantity provided you aim for that and act accordingly. For further productivity study data you can refer the book by Dr. Bheda "Improving Productivity in the Garment Industry"
Question for Readers: What is you machine productivity? Did you find this study useful? Share it with your friends who need this information.